Moose hair and birch bark. Those are 2 materials that we have not written about on this blog before. But now that we are working in the Artifact Lab on objects for all of our upcoming exhibitions and loans, we are seeing a wider variety of artifacts and materials in the lab. This embroidered birch bark case will be installed in our Native American Voices gallery later this month, so it is in the lab for examination and treatment. The 2-part case (the lid is a separate piece) was purchased by the museum in 1945. It is attributed to being Huron and from Canada. 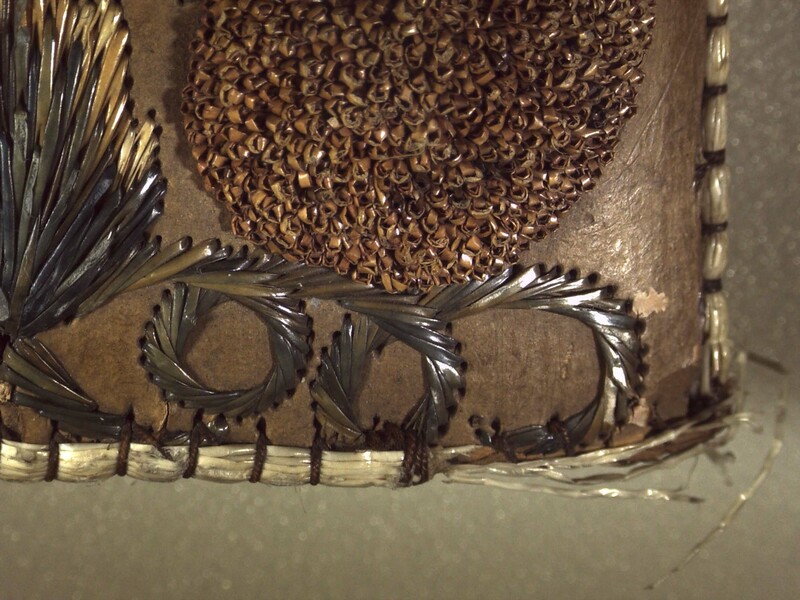 As you can see in the image above, some of the threads attaching the moose hair bundles along the edges are missing, causing hairs to become lost. These areas, as well as splits in the birch bark, will have to be stabilized before this case can go on display. 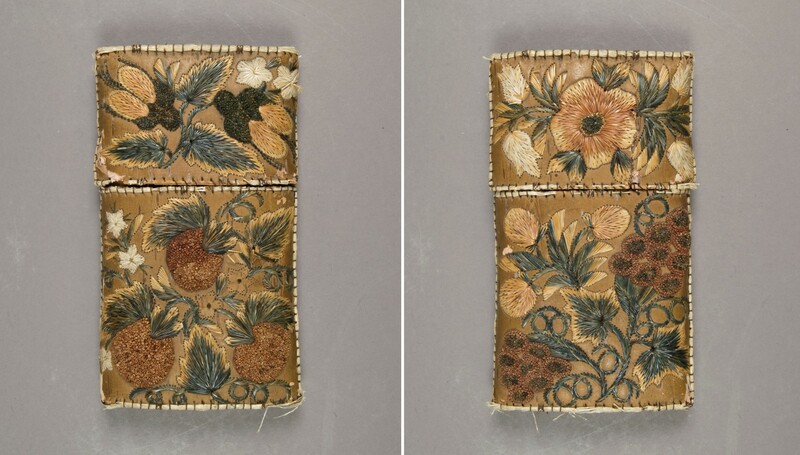 Check back for post-treatment photos, and visit the museum to see this case on exhibit by the end of May. There will be a heavy rotation of objects from Iraq and Iran in the Artifact Lab as we work on objects that will be installed in our new Middle Eastern Galleries, scheduled to open in April 2018. 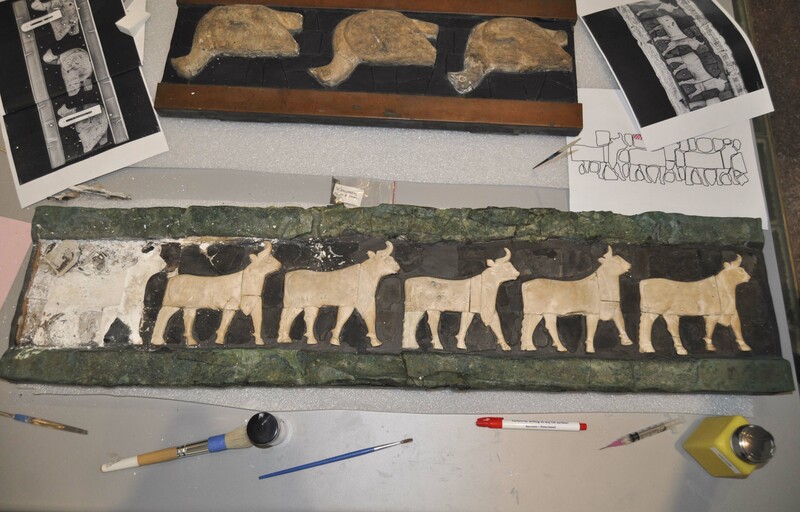 Two of the newest pieces to come into the lab (but 2 of the oldest things in here) are these friezes from Tell Al-‘Ubaid, a site located west of Ur in Iraq, which date to the Ubaid period (ca. 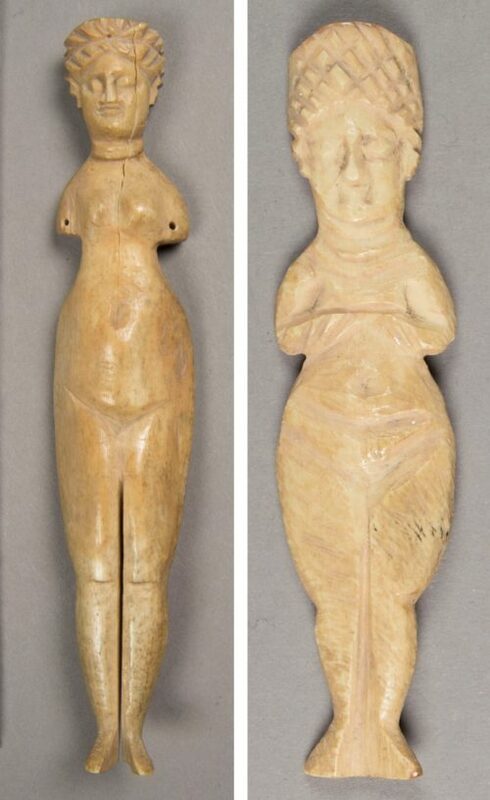 6500-3800 BCE). B15880, frieze of 6 bulls. These frieze fragments were excavated by Charles Leonard Woolley in 1924 as part of the British Museum/University Museum Expedition to Al-‘Ubaid. They both have been heavily reconstructed, displayed a lot, and loaned several times, so this is not their first time in the conservation lab. Due to some condition issues and because we are preparing them to go on long-term exhibition here at the museum, we have decided to deconstruct the old repairs and reassemble the friezes using materials that we expect will last longer and provide greater protection for the original pieces. The bull frieze after 2 days of treatment. The bull frieze after 1 week of treatment. 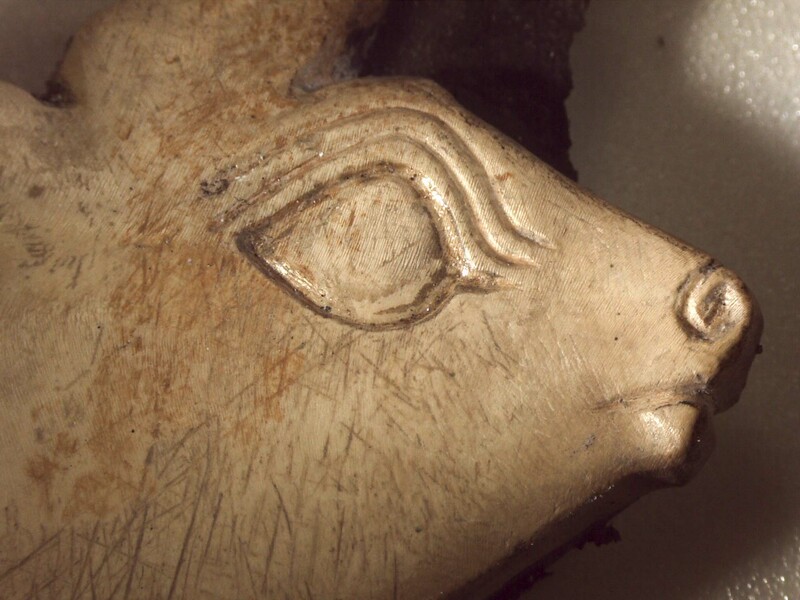 Detail of the first bull freed from the frieze, 7.5X magnification. The bulls are made of shell and are in excellent condition. Prior to treatment, the friezes were x-rayed to provide a better understanding of their construction and previous repairs, and to guide conservation treatment. 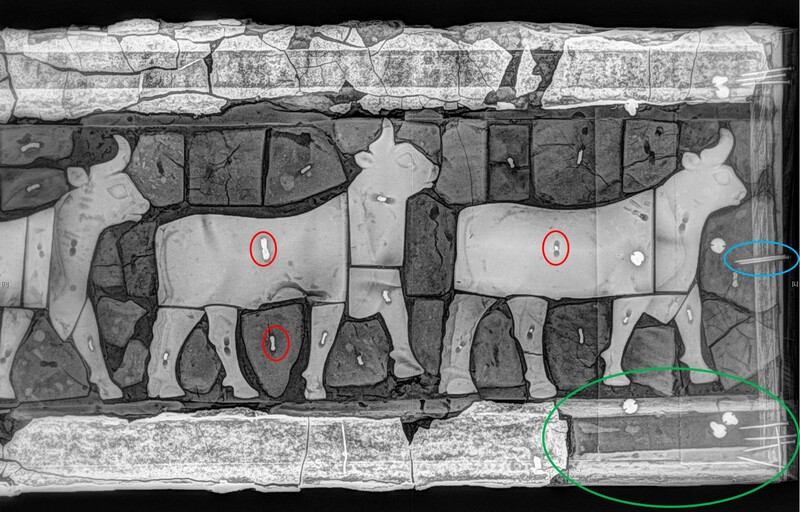 A digital x-ray radiograph of a portion of the bull frieze showing ancient methods of attachment (some are circled in red), modern nails (circled in blue), and a large fill made as part of a previous conservation treatment (circled in green). Check back for updates on this exciting and complex treatment. 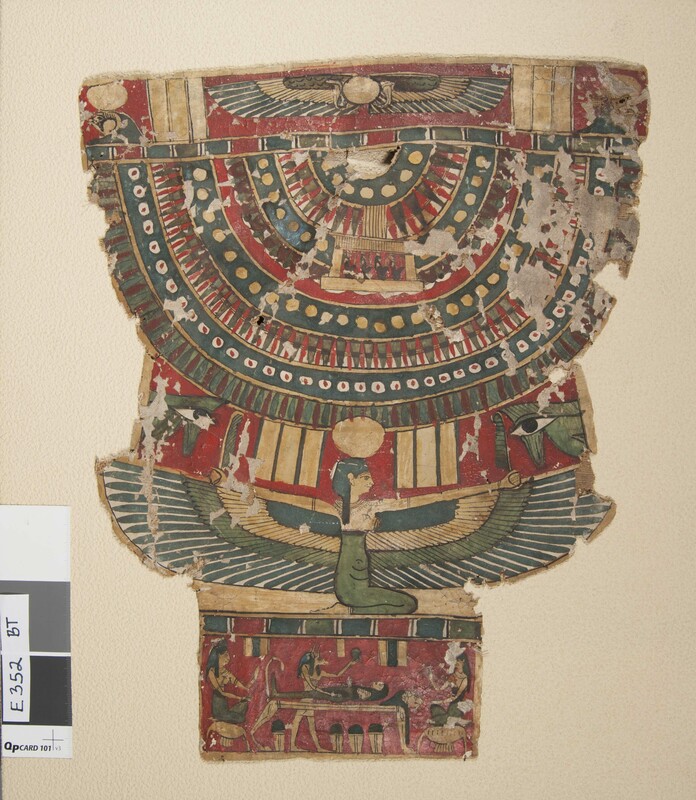 This painted cartonnage pectoral (E352) was made as a covering for the chest of a mummy, and dates to the Ptolemaic Period (ca. 200 BCE). We don’t have the mummy or any other items from the person’s burial, so we don’t know anything about who this belongs to other than that they were buried with this beautiful piece (and likely an equally nice mask, and leg and foot coverings). This artifact was previously on display in our Secrets and Science gallery and is now in the lab for conservation treatment. It was displayed vertically for over three decades, but since it has come into the lab, we have removed it from the old mount to allow for a full examination, documentation, and treatment. 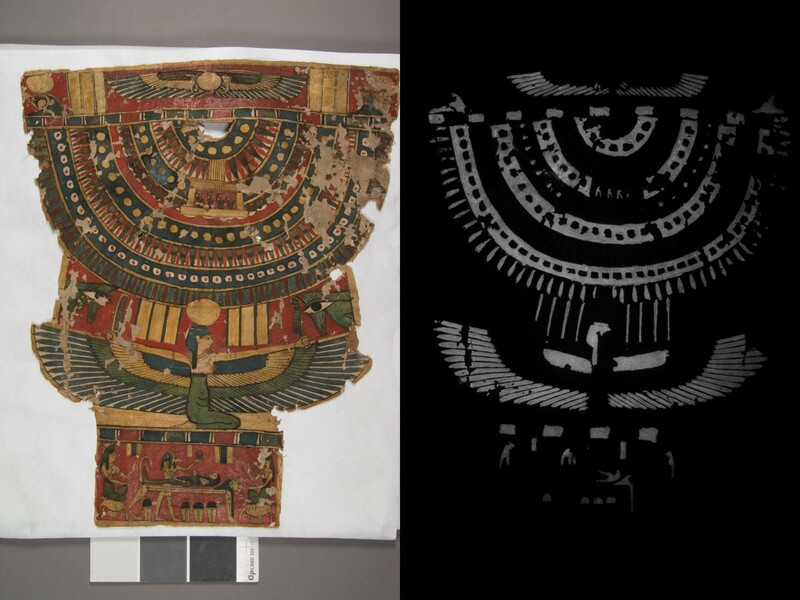 We have written about the unique luminescence of Egyptian blue before on this blog, and in the image on the right, above, we can clearly see where it was used to decorate this pectoral. Conservation treatment so far has included consolidation of the flaking paint with methyl cellulose, carried out under the binocular microscope. I have also been filling small losses with a mixture of Klucel G and glass microballoons, and backing weak areas with Japanese tissue paper. 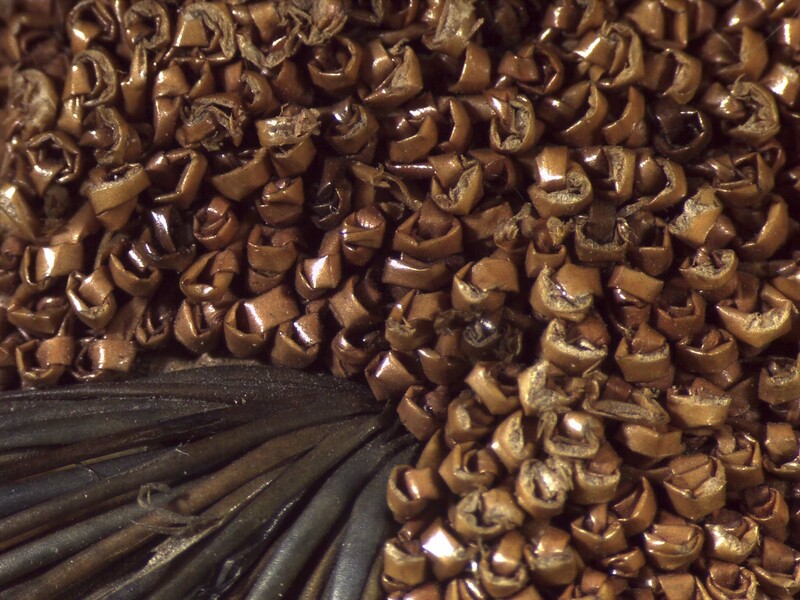 Here is a link to a mini-slideshow that shows a small section of the cartonnage under 7.5X magnification (the same section seen in the image above). The slidehow shows how I filled a tiny hole with the Klucel mixture, which then allowed me to readhere a tiny fragment of red paint. The change is subtle – see if you can spot where I reattached the paint flake! I just returned to work after 2 fascinating days of Death Salon: Mutter Museum, an event filled with presentations, speaker panels, Q&A sessions, murder ballads, a Dark Artisan’s Bazaar, and Death Quizzo. I have attended many conferences, but none quite like this one. There were a wide variety of speakers presenting on topics related to death, how different cultures deal with death (both past and present), and our relationship to death and mortality. 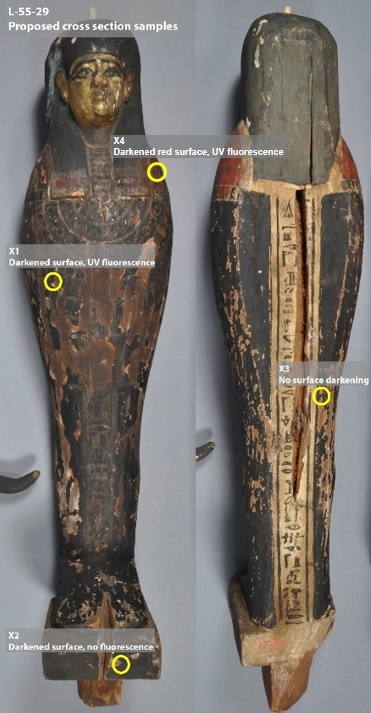 I spoke on the first day about my work on the mummies here at the Penn Museum – mostly about how we treat them today and how this has changed over time, using examples including PUM I, our baby boy mummy, Wilfred/a, and Nespekashuti. But you’ve heard about all of them before. Let me provide a brief outline of all of the other speakers, with links as appropriate. Dr. Marianne Hamel is a medical examiner who spoke about what it’s really like to be a forensic pathologist vs. what you see on TV. She also was a consultant for the wildly popular podcast Serial and co-founder of Death Under Glass, which also had a booth at the Dark Artisan’s Bazaar, selling watches, umbrellas, notepads, etc. featuring beautiful forensic microscopic images. Alexis Jeffcoat (Chemical Heritage Foundation) and Emma Stern (Laurel Hill Cemetery) spoke about the Friends of Laurel Hill Cemetery and their efforts to make Laurel Hill a place for the living as well as for the dead, with vibrant community programming. Ryan Matthew Cohn spoke about historical skeletal preparations and models of the human body, along with his own work to make exploded and dissected skulls. A panel discussion about American death spaces with Colin Dickey about the battlefields of the American Civil War and Bess Lovejoy on Hart Island: The World’s Biggest Tax-Funded Cemetery. I had never heard of Hart Island before, where unclaimed bodies and bodies of the poor and stillborn are soon to number one million. There are recent efforts to document the burials and transfer jurisdiction of the island from the Department of Corrections to the Parks Department. Evi Numen, Mutter Museum exhibitions manager, spoke about the Curious Story of One-Eyed Joe and the 1867 Anatomy Act, discussing the struggle to legislate cadaver dissection and ownership. Dr. Paul Koudounaris (a now 5-time Death Salon speaker! ), who has extensively researched charnel houses and ossuaries, discussed various cultures’ relationships with the dead. 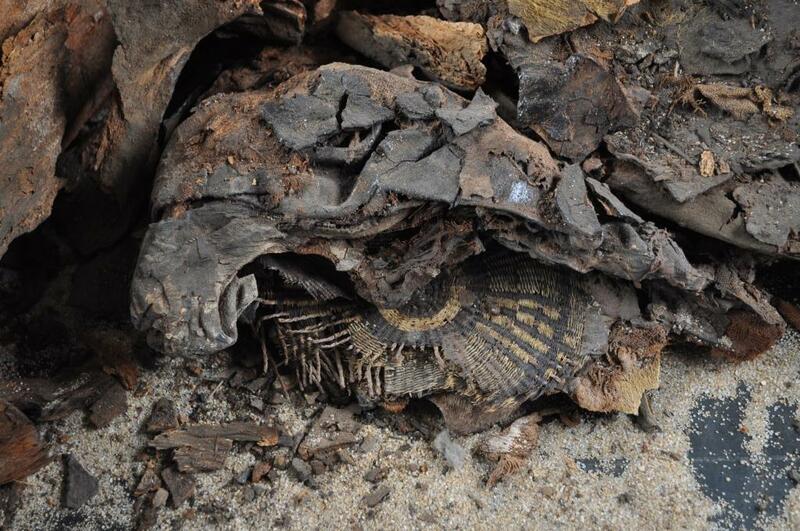 He specifically shared information about Indonesian communities who mummify family members and exhume them each year to care for and celebrate them, and sometimes even keep them in their homes. A panel discussion about anthropodermic bibliopegy (books bound in human skin) with Mutter Museum Curator Anna Dhody, analytical chemist Dr. Daniel Kirby, Juniata College Chemistry Chair Dr. Richard Hark, and Death Salon Director and USC medical librarian Megan Rosenbloom. 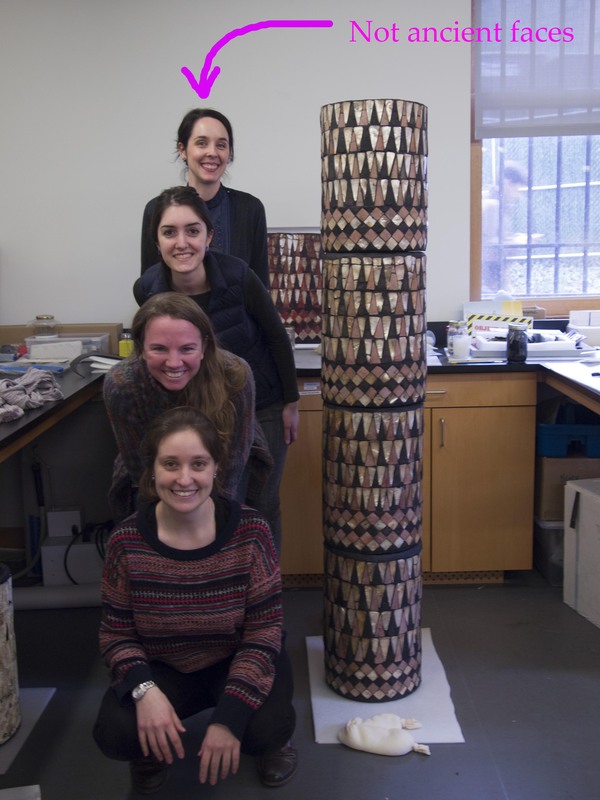 Their project is aimed at surveying and creating an inventory of books bound in human skin, and they are using peptide mass fingerprinting (PMF) to determine this. So far they have tested 22 books – 12 are actually human, while the others are sheep, cow, and even faux skin. The Mutter has the largest known collection in the world, with 5 authentic human skin books. A presentation by Sarah Troop about the rituals and art of child death in Mexico. She discussed the tradition, which used to be practiced in many Latin American countries, where dead children become a hybrid between saints and angels called angelitos, and the most famous angelito, Miguel Angel Gaitan from Argentina, who died in 1967. Dr. Norma Bowe discussed her death class at Kean University which she has been teaching for 15 years and has a 3-year wait list. She uses experiential learning in the class and they make several field trips, including to a hospice care facility, a Ronald McDonald house, a funeral home, a cemetery, a maximum security prison, a crematory, and a medical examiners office. A book has been written about her called The Death Class and its currently being turned into a TV show. Elizabeth Harper spoke about incorrupt saints, which apparently aren’t very easy to identify just by looking at them. Her presentation included images of saints she’s visited and a little game of “Incorrupt or Nah”. Artist David Orr presented his work photographing human skulls from the Mutter Museum collection and mirroring one side to create perfectly symmetrical results. 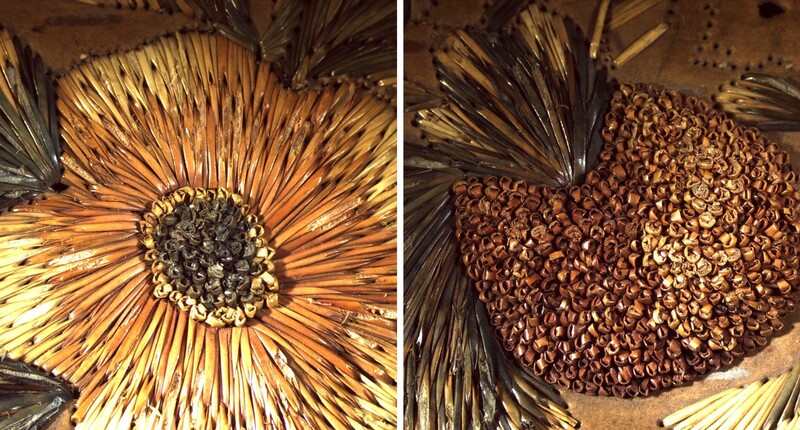 This project, Perfect Vessels, can be viewed on his website. 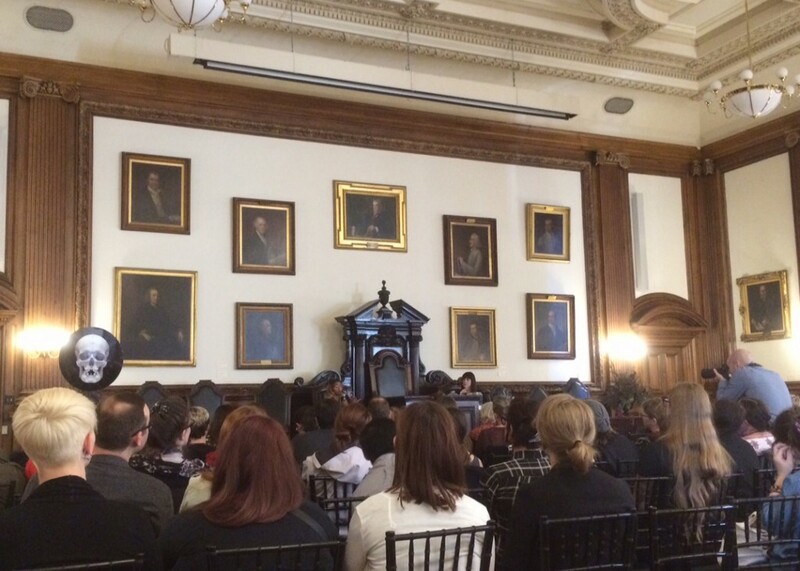 Penn physician Dr. Erin Lockard spoke about death from the doctor/daughter perspective in a conversation with Death Salon Director Megan Rosenbloom. She shared her experiences both as a physician who specializes in geriatric medicine and how experiencing her mother’s illness and end of life has affected her work. Mutter Museum Director Dr. Robert Hicks gave a presentation entitled Exquisite Corpses: Our Dialog with the Dead in Museums. He spoke about our relationship and discomfort around post-mortem imagery, and how other cultures are ahead of us in terms of articulating an aesthetic of death, decay, and mortality. Christine Colby discussed the issues for transgender people in how to preserve their identity in death and and the work that is being carried out to assist transgender people and their families and friends. The formal presentations of the conference concluded with a session entitled Ask a Mortician LIVE. Two morticians, Sheri Booker and Caitlin Doughty (Death Salon co-founder), fielded audience questions about their work. The talks were incredibly interesting and often quite inspiring (and even tear-provoking), and there was an enthusiastic audience of at least 200 people by my count (probably more). The engaging day-time programming was supplemented by some terrific evening events, including behind-the-scenes tours of the Mutter, a Death Ball with a performance of 15th-century funerary music by The Divine Hand Ensemble, murder ballad performances, and a Death Quizzo. This conference had some of the best opportunities for people-watching too. Unfortunately I didn’t capture many photos but if you’re interested you can see some on the Death Salon Instagram account. 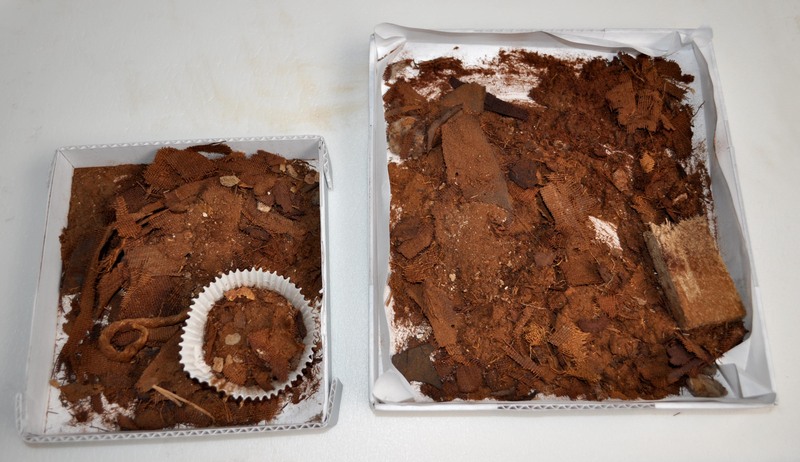 I’ve written before about mysterious things we’ve found during conservation treatment of our mummies (see this blogpost about the stuff we found at the bottom of Wilfreda’s crate). As I’ve been working on Nespekashuti, I’ve found some puzzling little bits at the bottom of his coffin and caught in his linen wrappings. Piles of deteriorated linen wrappings and other materials removed from Nespekashuti and his coffin during conservation treatment. In these piles, I found the mysterious bits. Some of these things I can recognize, but figuring out exactly what they are and how and why they got there is another story. 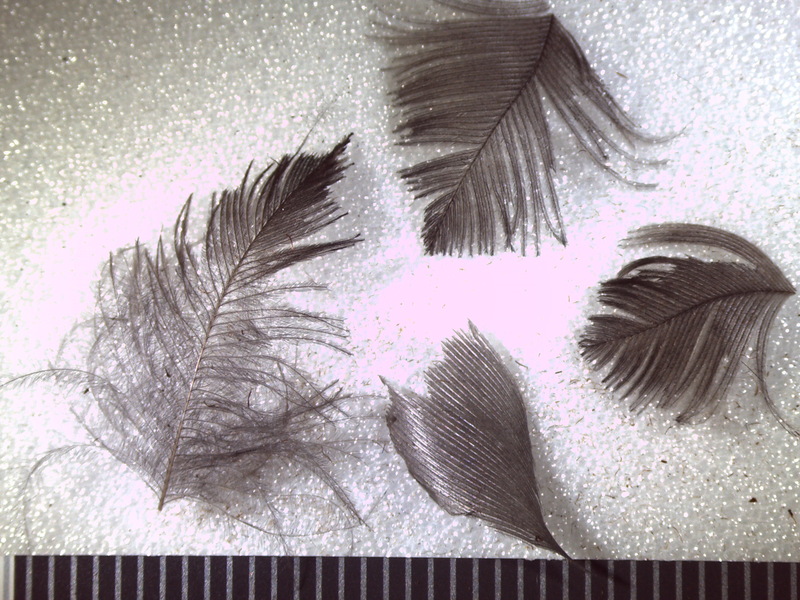 Barbules of one feather found with Nespekashuti, 200x magnification. 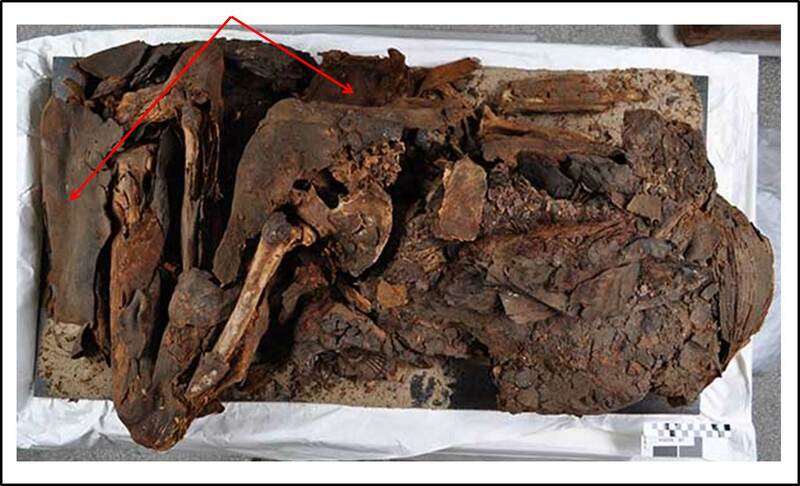 These two images above show some tiny bones that were found in Nespekashuti’s coffin. I consulted Dr. Kate Moore, zooarchaeologist and Teaching Specialist in the Center for the Analysis of Archaeological Materials (CAAM). 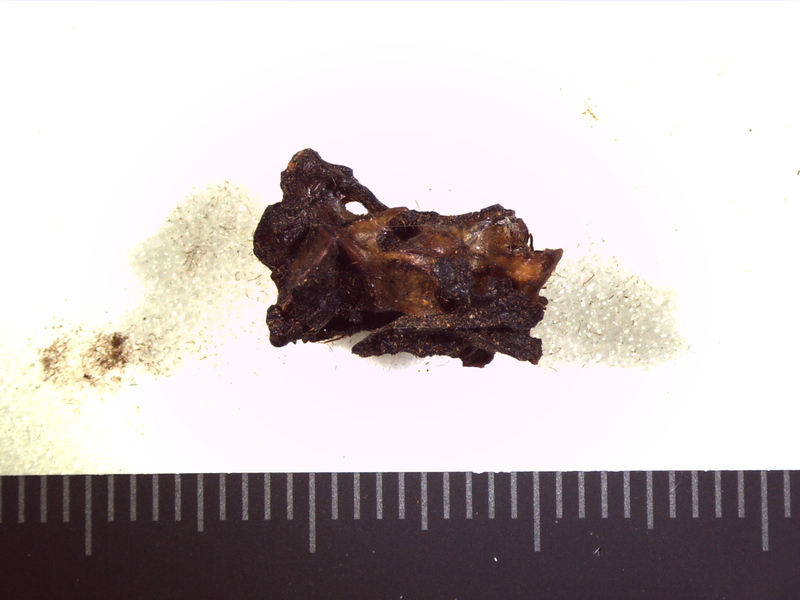 She confirmed that these are bird bones, and the second image shows two articulated bird vertebrae. Dr. Moore told me that upon her initial inspection, she thinks that they may have gone through a digestive tract (think:owl pellets, and that dissection you may have done in grade school!). These things look a lot like mouse or rat droppings, and there’s little bits of hair caught in some of them. No one said that working on mummies is for the faint of heart! 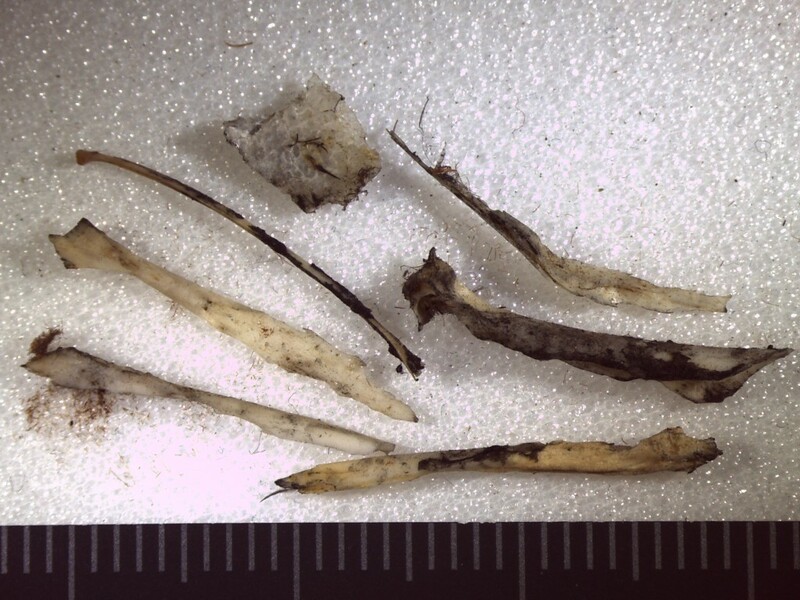 I also found some bits of cotton, tiny pieces of wood and plant materials, and even some broken glass. We can think of lots of good stories to explain why this stuff would be found with Nespekashuti, but in the end we’re not really sure. Like I said, we are reaching out to some experts about the feathers, so I’ll keep you posted if we learn more – identifying the feathers would be exciting, and could help explain how they got there! Is there an archaeobotanist in the house? Fortunately for us, the answer is yes. 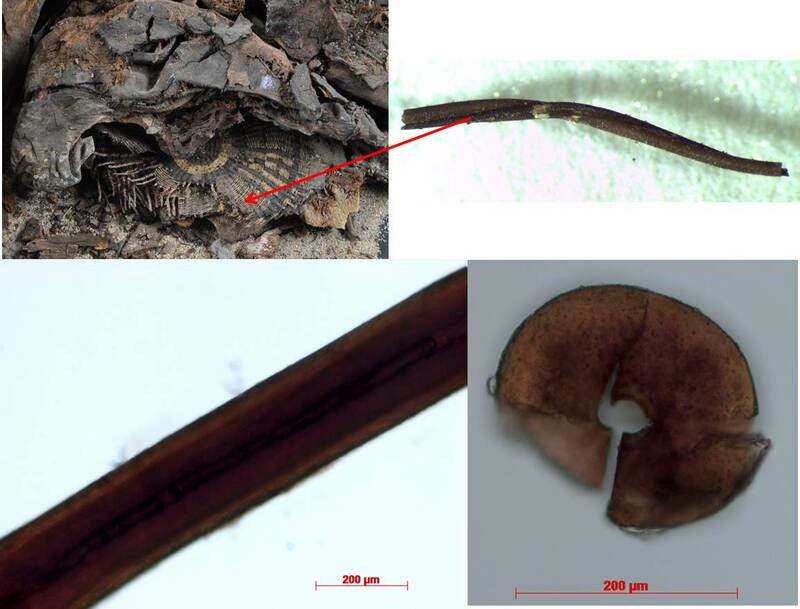 Following up on my recent post about identifying the wood used to make this Middle Kingdom painted wooden coffin, I showed the images of the thin sections I cut from some detached wood fragments to Dr. Naomi Miller, our resident archaeobotanist. 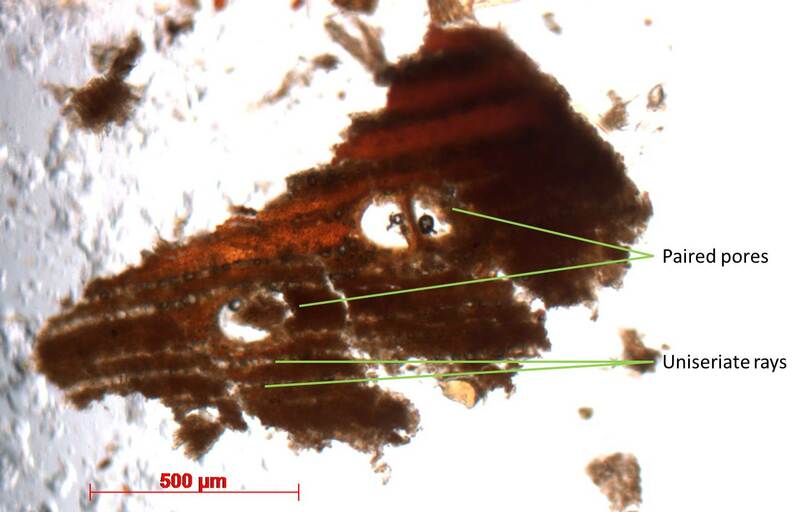 Dr. Miller typically deals with really degraded material, often tiny pieces of charcoal, so she was delighted to see that these samples showed enough information to make a more definite identification. AND, much to my delight, she confirmed my hunch that these boards are made of acacia. 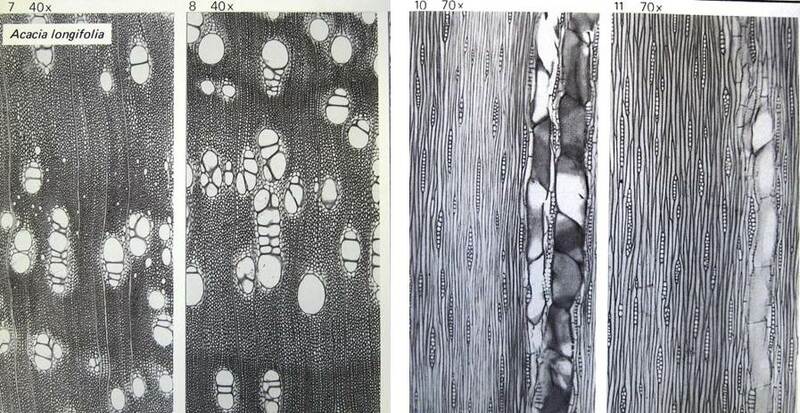 Here are the images she used for comparison, found in Anatomy of European woods, by Fritz Hans Schweingruber. In the tangential sections, we see mostly uniseriate rays, with some biseriate rays. 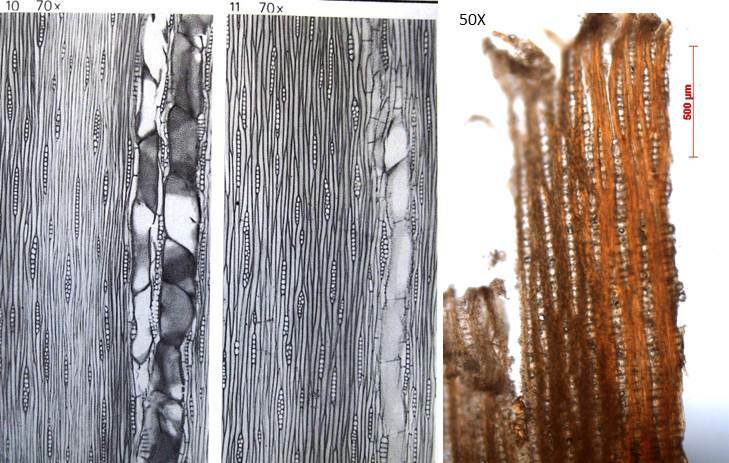 We compared our samples’ images with images of ash and carob in the same book, since these were also candidates originally, but there were enough differences for us to exclude these as possibilities. It is possible that there is something that we are not considering, but I think that I’m convinced by this work that this coffin was made with acacia. 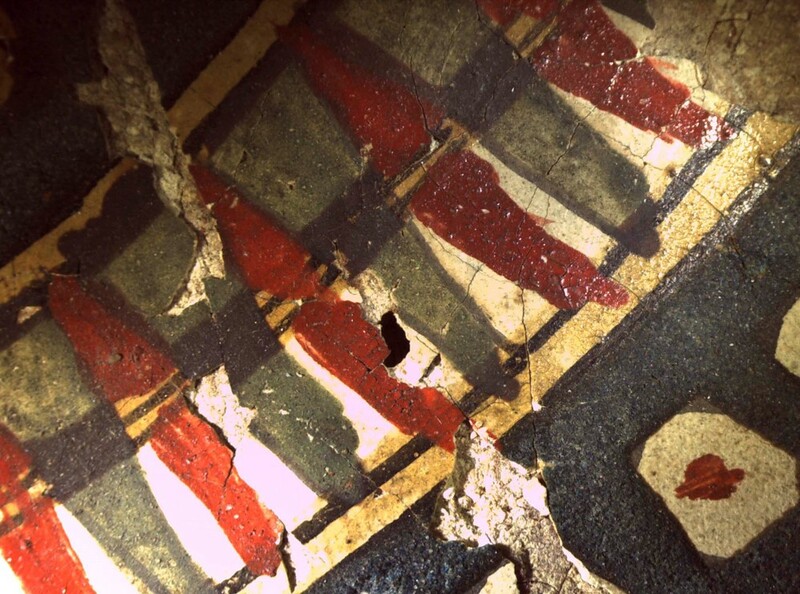 I’m currently treating 7 fragments of a painted wooden coffin from Abydos. Lately, many of our visitors have been asking what kind of wood was used to make this coffin. This has actually been a question that we have been asking ourselves, and we are trying to see if we can come up with an answer. In ancient Egypt, large timbers for coffin-making were scarce, so the wood was either imported from places like the Mediterranean, the Near East, or from other parts of Africa, or the Egyptians would cobble together smaller pieces of wood from local sources. Based on previous studies, we have a finite list of types of wood that are known to have been used, but from there we need to move to looking at the object itself. 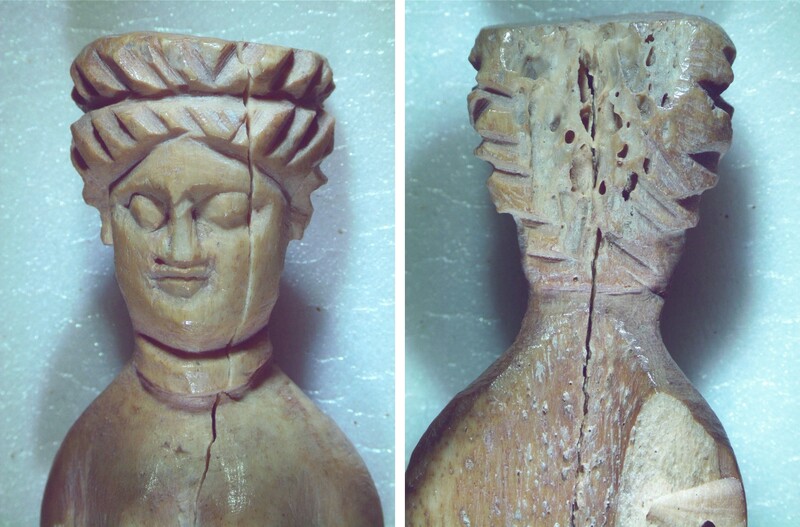 These images show the exposed wood on the side (left) and back (right) of one of the coffin boards. Can you guess what type of wood this might be? 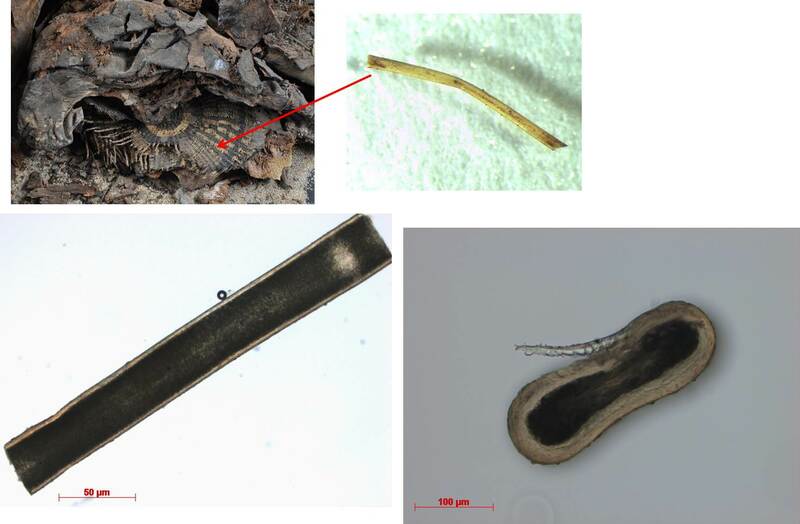 As conservators, we are educated not only in object treatment, but in the analysis of objects, and the examination of tiny fragments of objects, like plant and textile fibers, wood, and pigments. But many of us don’t do wood ID all that often, so it can take awhile to get set up, to re-orient ourselves to what we’re seeing in the samples, etc. AND it requires a sample, which we don’t often have access to. Fortunately, for me, I have some already detached samples from these boards and access to someone who does this type of work more frequently, archaeobotanist Dr. Naomi Miller, so I turned to her to help me with this work. Dr. Miller looked at the samples I had and selected one that looked promising, due to the exposed cross-section on one end. 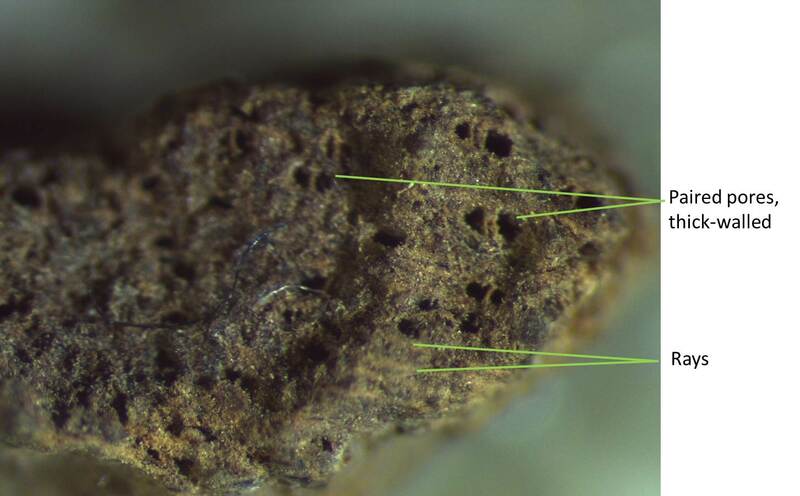 I mounted this sample under our binocular microscope and took a photo, to help her study it further and compare to known reference samples. 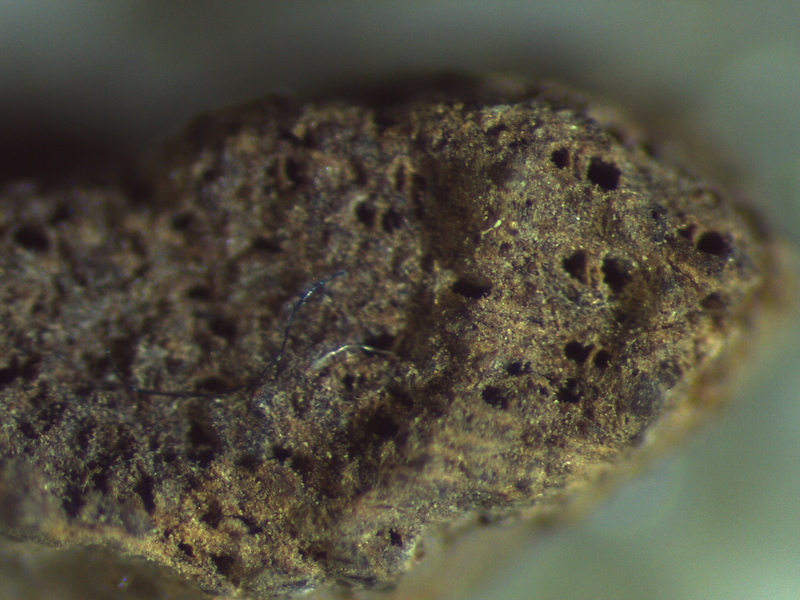 From this sample, Dr. Miller was able to determine that this is a hardwood, based on the presence of clearly visible rays and thick-walled pores, many of which are radially paired (pointed out below). 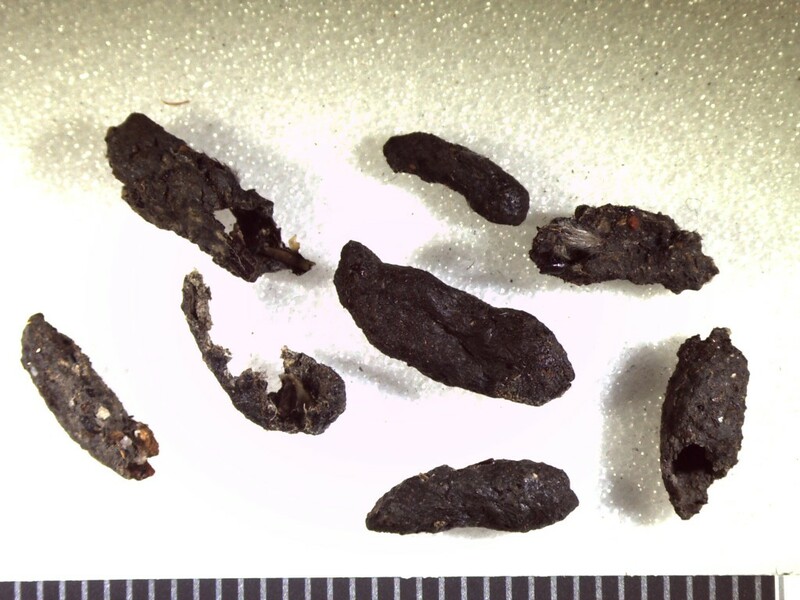 Based on these features and the known types of hardwoods used in ancient Egypt, this helped narrow down the likely possibilities to Common ash (Fraxinus excelsior L.), Carob (Ceratonia siliqua L.) and Acacia (Acacia sp.). Dr. Miller considered other types but ultimately excluded willow (Salix), oak (Quercus), elm (Ulmus) and sycamore fig (Ficus sycomorus) due to either the presence or absence of certain features. In an attempt to further narrow down the possibilities, I cut thin sections from the sample that Dr. Miller examined, from the cross-section and tangential surfaces, and wet-mounted them on glass slides. Looking at these thin sections with our polarizing light microscope (PLM), I was able to see some of these features a bit more clearly. In the cross-section above, the pores are visible as solitary or paired, and mostly uniseriate (1-cell wide) rays are visible. The tangential section also shows mostly uniseriate rays, but some bi-seriate rays are visible as well. Cutting these sections from the wood sample, which was quite degraded, was difficult and unfortunately I’m not really able to pick out many other features from the sections that I examined. I will have to get Dr. Miller to weigh in on this again, but in the meantime, I’m going to go out on a limb and say that I’m leaning toward this wood being acacia. One thing I forgot to mention is that the wood of the coffin board fragments is a deep red-brown color. Acacia is known for being a red, hard, and durable wood, and while it produces small timbers, we know that it was used for coffin-making, among other things. Last year we posted some information about Bruce, our Predynastic mummy (and the oldest Egyptian mummy in the museum) here in the lab. Bruce has been on ongoing project, but he is often tucked toward the back of the lab unless we are actively working on him. While he’s often not front-and-center, when visitors enter the gallery and they catch a glimpse of him, they know that he’s special, even if they don’t know what he is, exactly. Bruce, near the back of the lab, as viewed through the Artifact Lab windows. As soon as he is spotted, I am often asked “what is that?” “is that a mummy?” and “what are you doing with him?”. 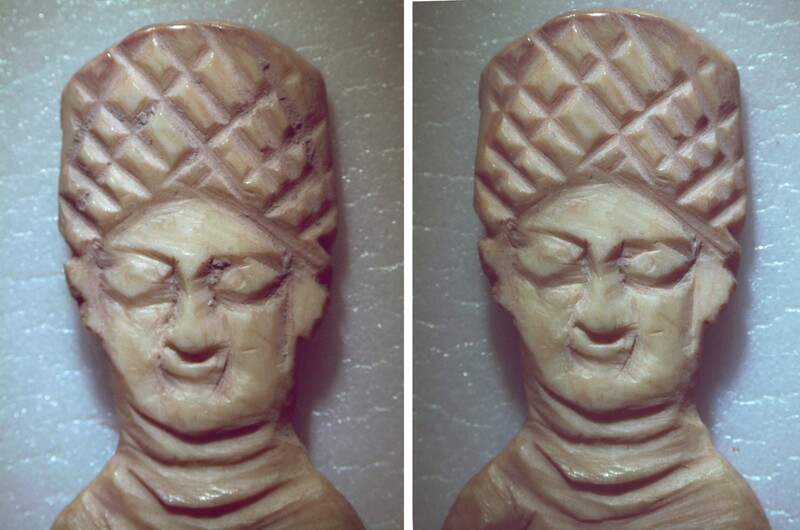 In conservation, we are not always actively treating objects (or in this case, mummies); some of our projects involve close examination and study of objects (often referred to as technical studies). 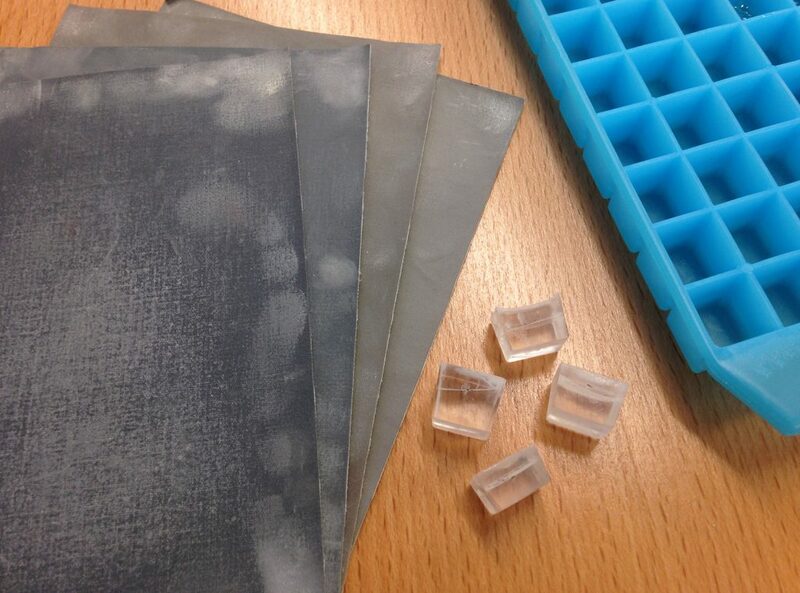 These technical studies may be a precursor to conservation treatment, but they may also be independent of treatment. 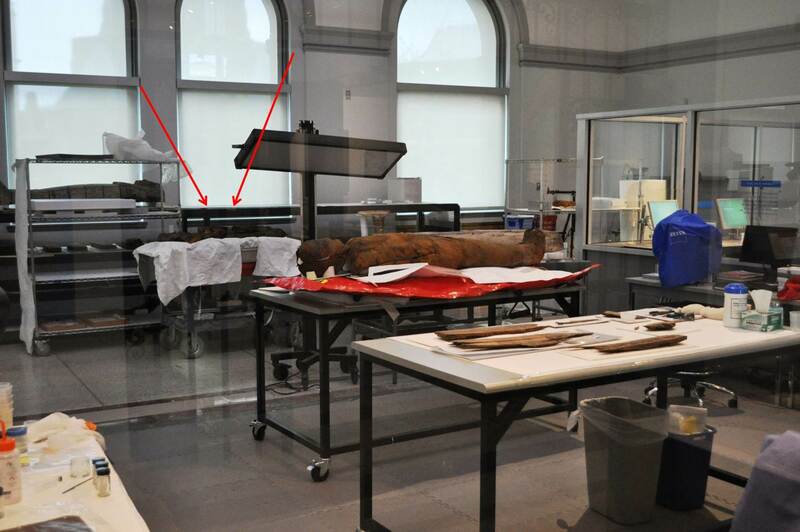 The red arrows are pointing out pieces of the animal skin bag wrapped around the mummy. These baskets are actually made of plant and animal fibers – the baskets are twined, and the passive elements (or warps) are made of plant fibers, while the active elements (wefts) are made of light and dark animal hairs. We know that the wefts are animal hairs based on our examination of these fibers using our polarized light microscope (PLM). 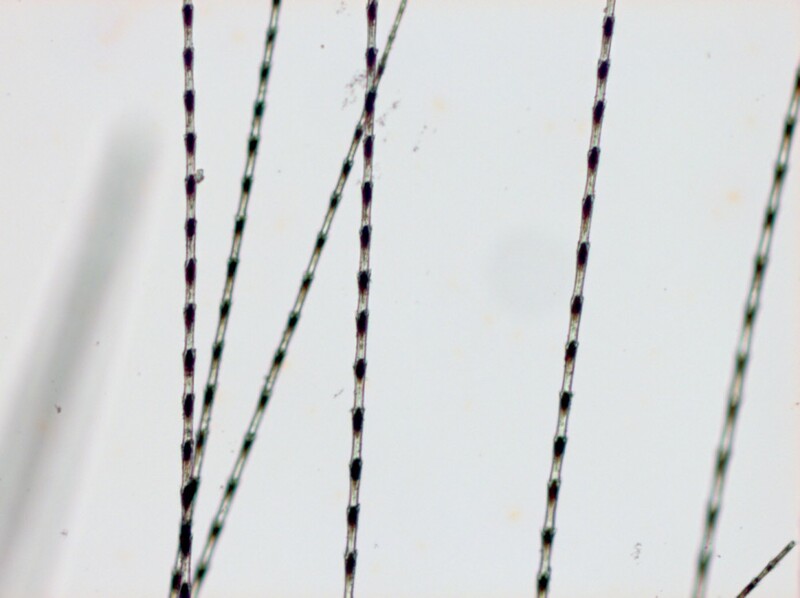 Sometimes animal hair can be identified based on the features observed under a microscope, by comparing the unknown hairs to known reference samples. Some great animal hair ID sources on the web include this great resource on the FBI website and the Alaskan Fur ID website. While we can clearly see that these fibers from the basket are animal hairs, we have not been able to identify them based on microscopy alone, so we are pursuing other analytical methods of identification, such as peptide mass fingerprinting (PMF). PMF uses a mass spectrometer to analyze the peptides in a proteinaceous sample, which can identify mammalian material to the species level using a micro-sized sample. Next week, I am attending a collagen identification workshop at Harvard, where I will learn more about PMF and its application to cultural artifacts. We are excited by the possibilities this technique offers – being able to identify the skin(s) Bruce is wrapped in and the materials used to make the baskets found in his bundle will add to our understanding of very early technologies and funerary practices in Egypt. We will certainly share our findings as we learn more.